Hygge (pronounced hoo-ga) is one of those words that, once you hear or see it, suddenly it’s everywhere. In this case, it absolutely makes sense why we can’t get enough hygge. Hygge appears everywhere these days, from Pinterest and Instagram, to books and endless articles. Creating and embracing hygge represents an ideal in our homes: we want to be comfortable, see comforting things as we look around, and make visitors feel welcome. It’s no wonder we can’t get enough of this Danish lifestyle trend. Today we’re talking about what hygge might mean in the most important room of your home — the kitchen. We’ve got some tips, style ideas, and inspiration to help you bring hygge to your kitchen and dining room. What Even is Hygge Style? I’m probably wrong to even talk about hygge as though it is a style or design to aspire to, but when I think about emulating hygge in the kitchen, I think about style and decor. Its original Norwegian meaning translates to ‘well-being,’ so that coupled with ‘coziness’ gives a bit of an idea of what this might look like. 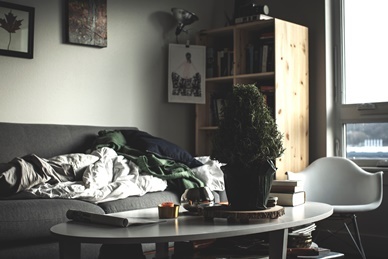 Of course, what makes you feel content and cozy is unique to you, but borrowing elements of Scandinavian style (plus the fairly universal things like lighting, candles, comfortable furniture, and so forth) can help you achieve your own personal hygge style. 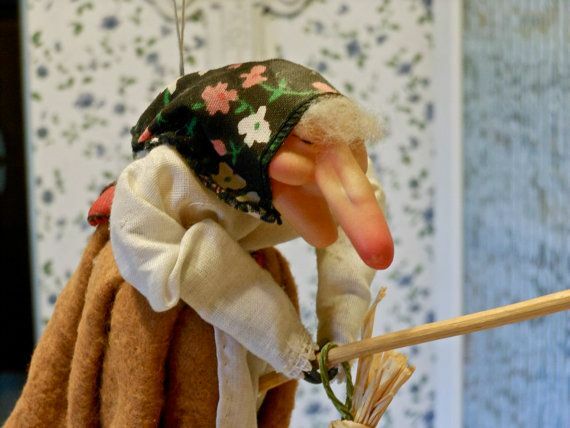 In case you need a sensory example, here are a few hyggeligt moments to imagine. 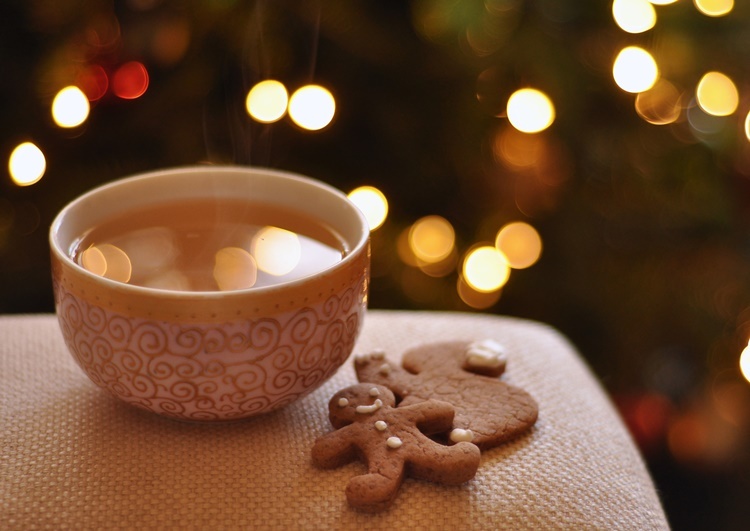 Christmastime is the epitome of hygge — just imagine yourself surrounded by loved ones, holding a warm mug of coffee or hot cocoa, with twinkling lights and soft music playing in the background. If this feeling appeals to you, think about how to bring some of that sensation to your design. What comforts you most? Which aspects feel appropriate for year-round? There’s your starting point. Hygge is about companionship, particularly combined with food and a casual atmosphere. Think of a cozy gathering with those you love, how everyone got comfortable and chatted for hours. That pleasant feeling of camaraderie, coupled with a cozy atmosphere (bonus points for everyone wearing sweaters and for warm blankets, mood lighting, and stormy weather outside). 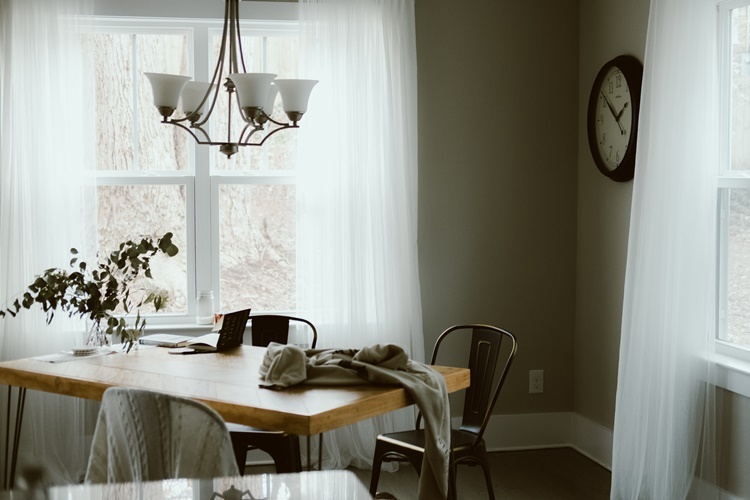 That sensation is hygge, and the goal to capture it in your kitchen might involve preparing for company, or arranging your space in a way that is accommodating, open, and welcoming to visitors. Now that you have some examples of hygge feelings, let’s take a look at some basics of Scandi design — particularly those elements that help you achieve hygge. When it comes to the foundation of Scandinavian design, color is out. 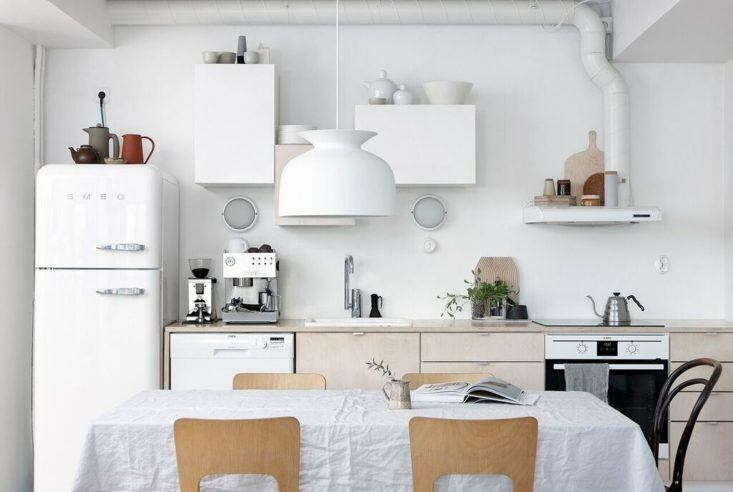 I’m mostly kidding, but you’ll consistently find whites and other neutrals taking center stage in Scandi kitchens. When emulating hygge in your kitchen, sticking to neutrals (and bringing in wood, textures, etc. — more on that next) is a sure way to create comfort. Neutrals keep it light, airy, and clean feeling. 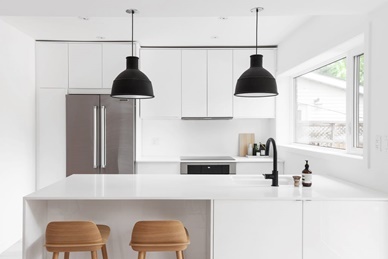 Of course, you don’t have to forgo color completely, but if you’re aiming for a hygge-kitchen, consider neutrals (especially white) as a starting point. Use color strategically, or stick with basics and let natural elements (like wood, fibers, or foliage) pop. Here are two other example kitchens that show neutrals are homey, not boring. 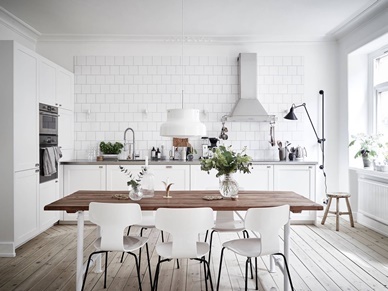 Scandinavian design features a lot of natural elements, most notably wood. From wood floors to cutting boards and cabinets, many of the notable designs make use of wood in ways that feel, well, hygge. The warmth of the wood contrasts and complements the neutrals, lending itself to the rustic feel of hygge kitchens. Even if you’re missing the wood floors or butcher’s block countertops, you can still utilize wood in surprising and comforting ways. Keep your big wood cutting board well oiled and on your countertop. Look for wooden decor items. Embrace all your wood utensils, and display them prominently in a utensil crock. 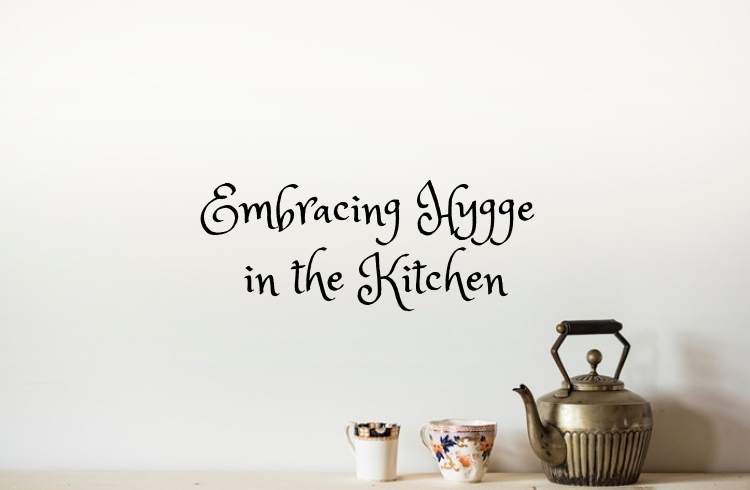 Comfortable textures are very important in the hygge kitchen, especially if your aim is to make you, your family, and company feel comfy in the room everyone tends to hang out in. In The Little Book of Hygge, Meik Wiking emphasizes the importance of lighting to hygge, saying, “The closest you will ever come to seeing vampires burnt by daylight is by inviting a group of Danes for a hygge dinner and then placing them under a 5,000K fluorescent light tube.” The right lighting is crucial for hygge, and once you reevaluate your current lighting situation, you’ll see why. Mid-Century Modern style commonly appears in Scandi kitchens, and that’s because both what we consider Scandinavian design and mid-century modern emerged around the same time. Many of the big names in MCM came from Scandinavia, so much of what we consider in either of those styles are basically the same. One of the key differences between MCM and Scandi design is that the latter tends to be more rustic, with less of the bold colors and patterns typical of midcentury design. Scandinavian design features wooden and textural items in a bigger way, and your hygge style can play up rustic elements if it fits your aims. Scandi styles can be fun and eclectic, too. 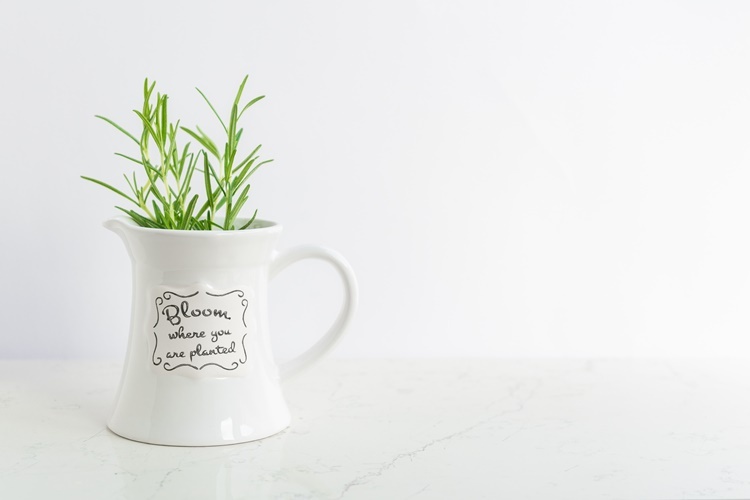 Special knickknacks, your copper collection, plants, and adorable canisters have a place in hygge homes! Because hygge is a feeling or a mindset rather than a decor style, your aim should be to make your kitchen feel cozy, joyous, and very you. Some Scandi styles are very minimalist, but I think of hygge more of minimal-ish. 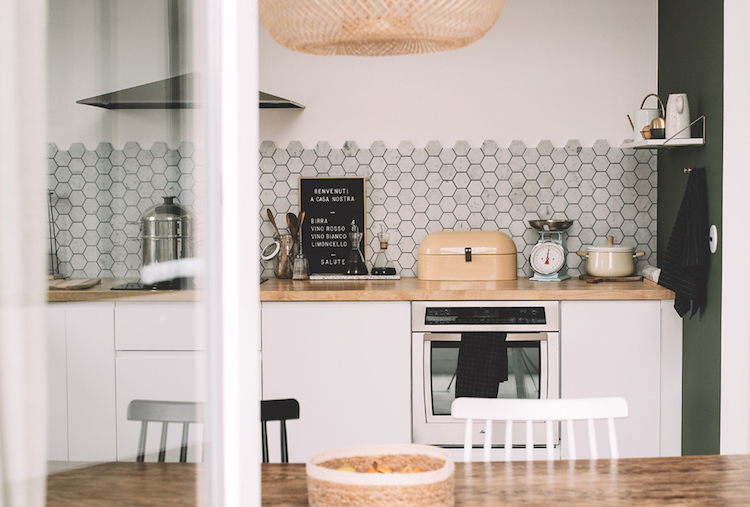 In all the kitchen examples we’ve shared in this post, the hygge feel comes from clean, bright decor. A hygge kitchen is not cluttered, nor is it fussy or extravagant. Creating a hygge kitchen means not seeking to impress everyone with fancy decor or expensive stuff you don’t want anyone touching. Instead, it is inviting and functional. 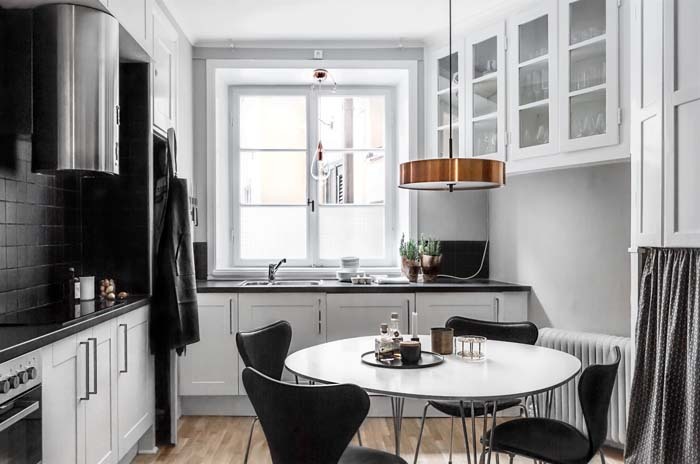 The kitchen above borrows from Scandinavian style, but for me it doesn’t feel very hyggelig. I do think it’s a good base, but I would add some personal touches and texture to make it cozier. 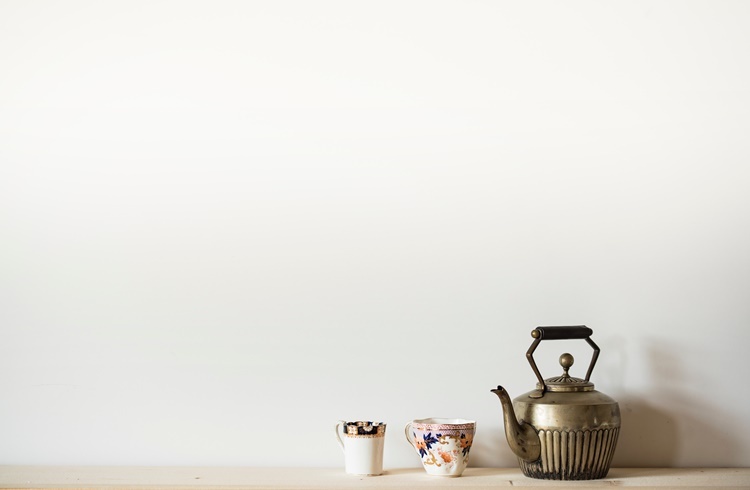 If you’re a Marie Kondo fan, using her methods on your kitchen to tidy up might be a great way to achieve hygge. After all, “sparking joy” and hygge aren’t that different. Her methods might not work for everyone, but I like it as an option to tackle a cluttered or fussy kitchen that just isn’t quite hyggelig. Finally, there are a few other elements that can be markers of hyggeligt Scandi design. 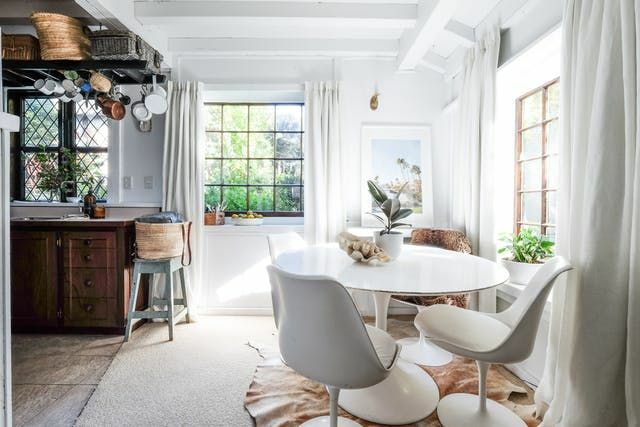 Scandi designs (and hygge enthusiasts) tend toward rounded shapes — such as round dining tables and pendant lighting — and something about that (I couldn’t tell you exactly what) makes the style. Perhaps rounded edges feel friendlier, and round dining tables feel more intimate. 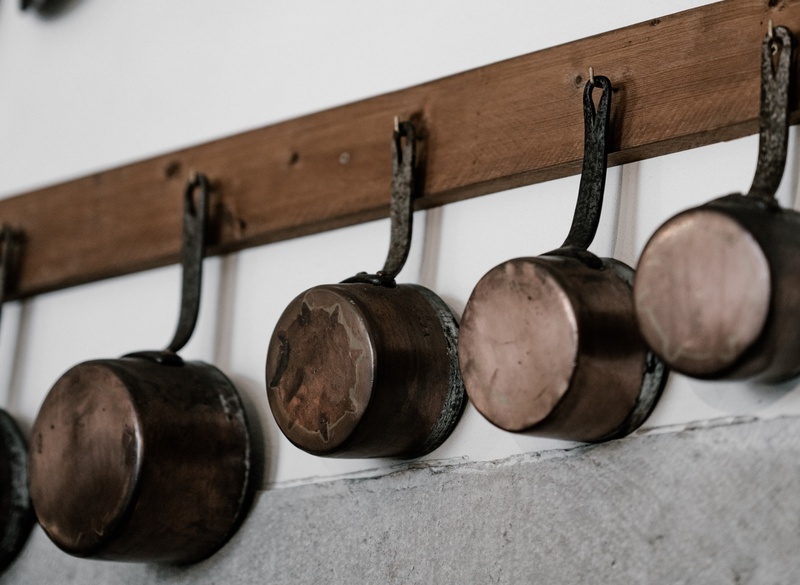 There are also items you’ll see frequently, such as copper cookware and decor, plants, and cake stands. You can’t buy hygge, of course, but you can keep it in mind if you’re already looking at things for your kitchen. You can also look for things you already have and find new ways to showcase them. Here are a few ideas. 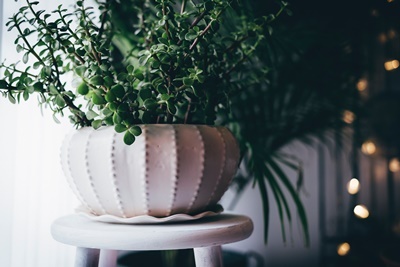 Few things brighten up a space and add character and charm like a potted plant. 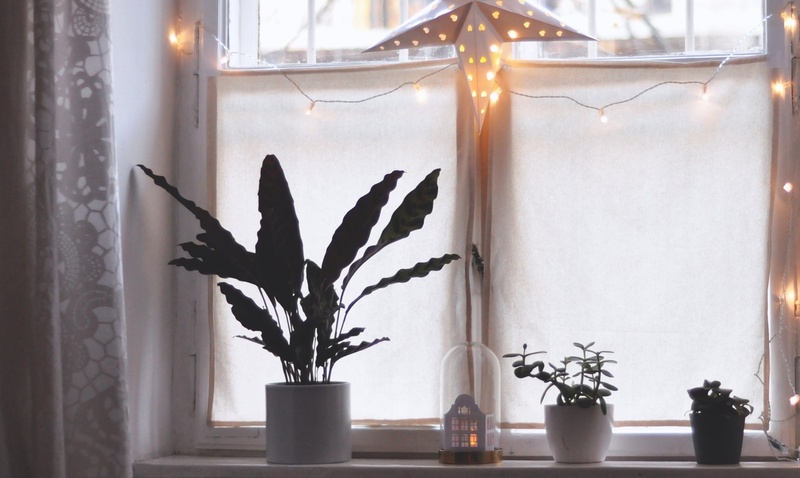 If you’re on a budget or just need a quick way to add some hygge to your kitchen or dining area, try adding a few plants. Warm beverages scream hygge (or at least whisper it in a hygge-appropriate tone), and a teakettle is a hygge must-have. This element is a great way to express your style and add a cozy but small impact in your kitchen. Add some teacups with saucers and sit around your now-cozy dining table — voila! Hygge! Rugs and tablecloths are inexpensive items that can dramatically change your decor space. If your kitchen needs some hygge TLC, try some textures in neutrals that add some charm and comfort to your space. In Denmark, hygge is associated with food more often than not. 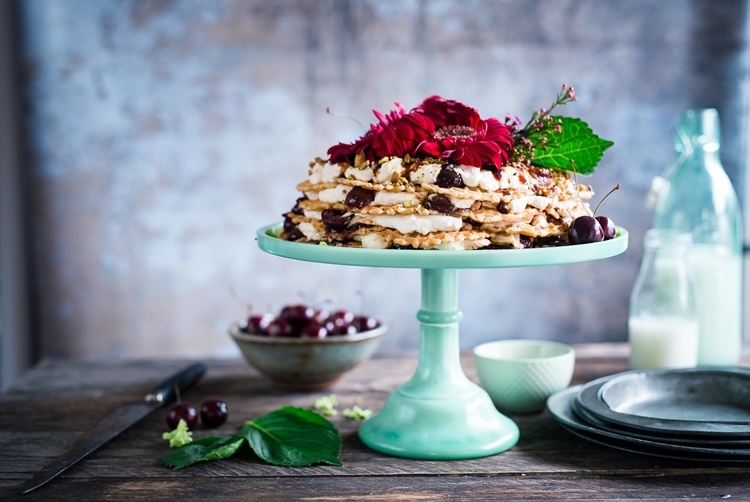 A simple and tasty way to hygge your space is to bake a cake, add it to a charming cake stand, and then serve it to your loved ones. (Plus you’ve got that kettle going, too, right?) You’re on your way to becoming a hygge expert. The absolute easiest way to bring hygge into the kitchen is with candles. Stock up on inexpensive unscented candles of various heights and types (tea light, votive, etc.) and arrange them around the kitchen and dining table. 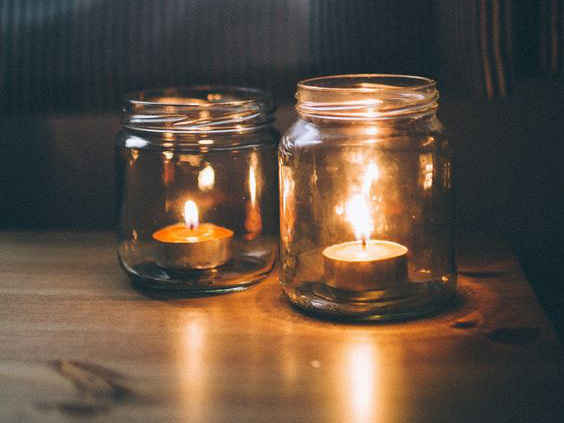 Repurpose old Mason jars or glasses and make them into cozy candle holders for maximum light distribution and zero effort. An easy recipe: baked goods + hot beverage + candles = instant hygge. Hygge isn’t really a style, nor is it something you can simply purchase or build. Instead, hygge is a mindset — a feeling — that your kitchen can prompt in your family and your guests. What we’ve covered so far is meant to help you find your own hygge, but here are a few other tips to keep in mind. Hygge is down to earth. It’s relaxed and at ease. It’s never fussy or overdone. Take a cue from the Danes and keep hygge alive by communicating openly and without boasting. A hygge way of life creates comfort, so in a way it’s a very nurturing mindset. You can consider working toward creating hygge as a kind of self-care and a form of love for others. Hygge doesn’t play well with electronics. Since hygge is so much about caring, entertaining, and joy, it’s no wonder that phones and other electronics can kill the mood. You might ban all electronics from the kitchen and dining area at all times (or at the very least, during meals and while guests are over). Or you might use this concept to help you use electronics less. Hygge goes hand in hand with winter but should be achievable year-round. Comfort foods, baked goods, sweaters, and fireplaces. These are probably some of the best-known hyggelig features, but hygge can be great for every season. It might seem more attainable during the colder months, when we naturally try gravitate toward coziness. But summer deserves hygge, too! I’m excited to hygge-fy my kitchen with some of these ideas and inspiring interiors. What will you do to bring hygge into yours?